Divani Palace Acropolis enjoys a priceless location right by the world-famous Acropolis, the perfect place to savour Athens fascinating history. A unique feature of the Divani Palace Acropolis hotel is the ancient ruins of Themistocles wall, discovered in the foundations during construction and tastefully incorporated in the hotel's architectural design. It is walking distance from the new Acropolis museum and Herodion theatre. The Acropolis Metro Station is within 500 metres, while scenic Plaka is a 10-minute walk away. 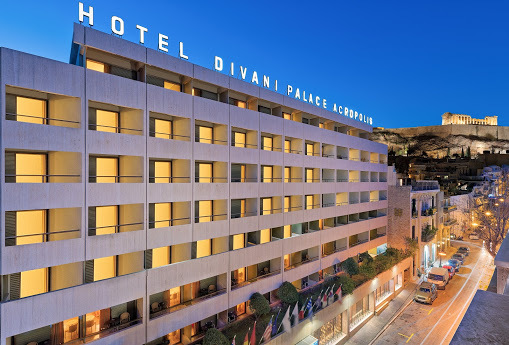 Divani Palace Acropolis is situated right in the heart of Athens next to the Acropolis and the Parthenon, and is easily accessible from the Athens International Airport by metro and express busses. It is also located at a walking distance from major hotels and many other smaller hotels. Commuting to and from the city center and the Athens International Airport or other locations is quite easy. By Metro: There is direct access from the airport and the city center to Divani Palace Acropolis from the metro station “Acropolis” on metro line 2 (red line). The metro station “Acropolis” is 500m from the venue. By Bus or Taxi: Express busses to the city center and taxis are available from the Arrivals Level of the Athens International Airport.